Hello Middle-America, how are ya’? This recipe from Food and Wine was a good way to use up a pile of leftover pepperoni in the fridge. It was fast, it was easy, and it tasted almost exactly like a Supreme Pizza Hut pan pizza without the cheese. Whoo hoo! 1. Prepare the pasta according to directions. 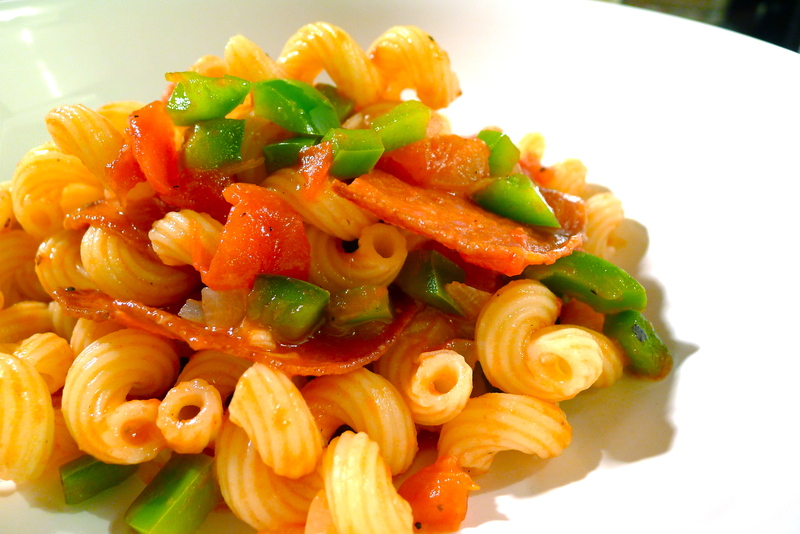 Make sure to reserve some of the pasta cooking water before draining the cavatappi. 2. 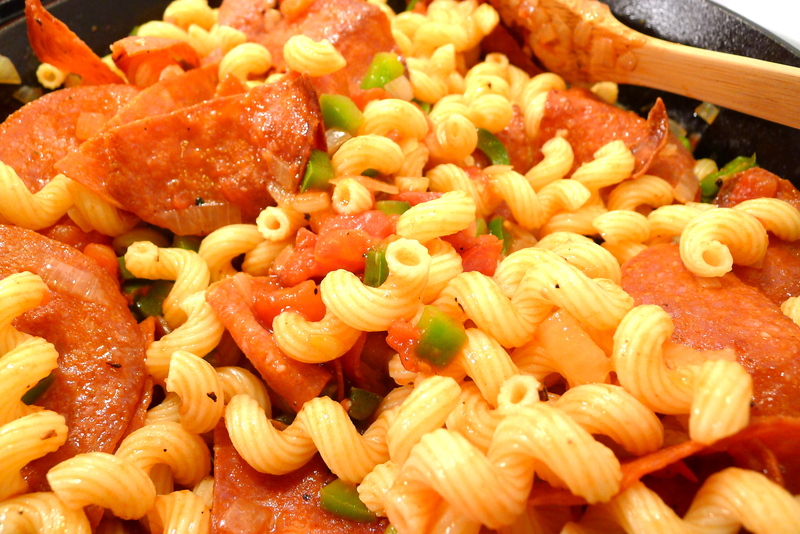 While the pasta is boiling, heat the pepperoni slices in a large skillet over medium heat until they just begin to brown. Remove the slices from the skillet and transfer them to a paper towel-covered plate to drain. Wipe out the excess fat from the skillet with another paper towel. 3. In the same skillet, heat the tablespoon of olive oil over medium heat. When the oil is hot, add the onions and the green pepper. Sauté the vegetables until the onions are translucent and the peppers are beginning to soften. Add the minced garlic to the skillet and cook for about 30 seconds longer. Now add the diced tomatoes to the vegetables. Stir to combine everything before covering the pan with a lid. Lower the heat and simmer the sauce for about 10 minutes, adding some of the pasta water if the sauce looks like it needs it. 4. After the sauce has thickened, adjust the seasoning to your taste. Toss the pasta and the pepperoni with the sauce. Serve. I wish I had leftover pepperoni right now. This a great idea. Thanks for the message! Your blog looks great, too. Tasty macaroons!